What Party Hosting Style Are You? Ever wonder what your party hosting style is? Personally, I oscillate between Barefoot Contessa and Absolutely Fabulous, sometimes within the very same evening. 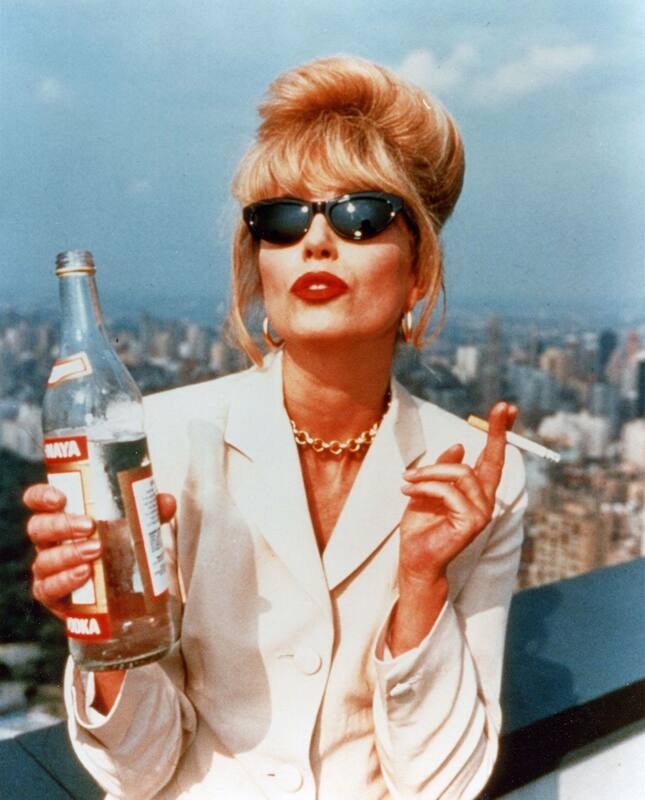 I’ll be full-on Ina when I prep everything and then turn into Patsy as soon as the champagne starts to flow. But like, I’d never be Rachel Ray for anything. She’s just too abrasive. I mean, anyone who abbreviates extra virgin olive oil to EVOO doesn’t deserve a place in my heart. Just saying. So, let’s have a little quiz time shall we? Need a man? Not when you have man hands. If you picture yourself as Julia Child (or as Meryl Streep playing Julia Child, which is also valid) in the kitchen you are literally #goals. Not only is Julia a totally amazing and attentive hostess, but she can actually de-bone and butterfly a 40-pound turkey with one hand AND change a flat tire at the same time. You prefer to serve French food, and will cook chestnuts five different ways in the same sitting. You probably arrive to the table with cuts and burns all over, but no matter. You can’t even feel pain. Third degree burn from the goulash? Child’s play. You use an industrial strength blowtorch to finish off your crème brûlée. And have absolutely no problem killing a lobster, or a bison, for a quick weeknight meal. Obviously, your ideal meal: Start with some escargot. Next, french onion soup. Baguette. Boeuf Bourguignon. Lots of root vegetables. Red wine basically on tap. Cheese platter. Finish with a Mont-Blanc cake as you force your guests to play a competitive round of Charades or Jenga. I mean, who doesn’t love Ina Garten? She is literally my spirit animal. When she’s not stuffing her husband Geoffrey like a Christmas goose, she’s busy schmoozing with Taylor Swift. Girl gets around. One token sign that you’re a truly a Barefoot Contessa? Butter! One stick just isn’t enough when you’re cooking with Ina. And she always likes to start her meals with a nice stiff drink – I can get down with that. Her cookbooks are brimming with cocktail recipes and canapés. She’ll even use the back few pages to school you on etiquette, flower arrangements and table-settings. And she always has everything timed down to the second. All with a smile, my friends, all with a smile. And remember, store bought is JUST FINE. God bless, Ina. Boom, your ideal meal: Start with a fruity martini and dozens of appetizers. Later, move into the main meal. Rack of lamb. Lobster orecchiette. Endive salad. Creamy mashed potatoes. A side of poached salmon. More drinks. Dessert could be anything as long as the main component is chocolate. Although, your friends will never do the dishes or set foot in the kitchen. Instead, they are out back roasting marshmallows while you prepare everyone hot chocolate with peppermint sticks, whipped cream and swag bags, served at midnight, precisely. First of all you don’t cook. Second of all, you don’t eat. So, now that we’ve established some ground rules, it’s time to explore your party hosting style. Champagne and caviar? Yes. A butler to serve everyone? Yes. Couture dress code requisite? Like you even have to ask! Being Patsy requires a certain type of finesse. People want to be around you but you don’t cater to them. People leave their shoes on – no exceptions – when coming over. Duh, you have a butler who serves caviar and lobster to those who insist on eating. However, if your guests don’t arrive slightly buzzed already, you’ll be sure to have them singing on tables within twenty minutes. They describe you as the life of the party and you love to quietly observe everyone, judging-ly, as they make fools of themselves around your living room. OK, your ideal meal: champagne on tap. Caviar, lobster, whatever else anyone wants. The butler will just go get it. Vodka for anyone who wants, straight up. Gossip for dessert. 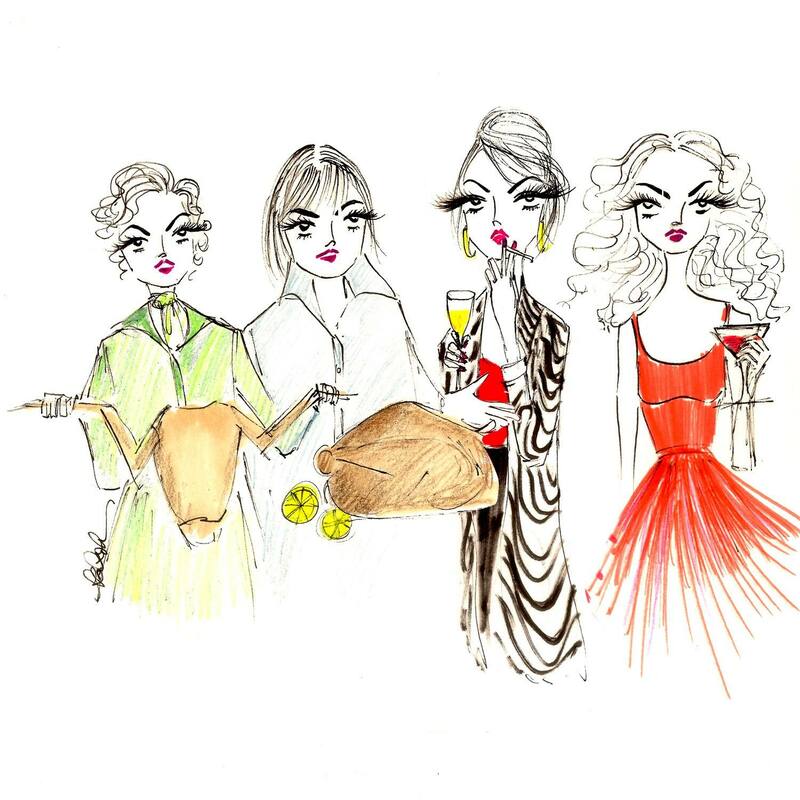 If you’re Carrie Bradshaw when it comes to hosting a holiday party, you don’t even have people over. Instead, you rent out a private room at some dingy Chinese restaurant (or conversely, if you’re post-Big Carrie Bradshaw, you rent a room at The Ritz) and invite all of your friends to feast with you. In fact, you prefer cocktails but sometimes you’ll even drink a scotch, straight up, if you’ve got love problems. And when don’t you have love problems? So, your friends take turns asking you for advice and you gladly oblige. Likely, you’re a philosopher, especially after a couple drinks. But when the music comes on, you take your designer heels to the dance floor and let loose. The night ends with street meat or MacDonald’s drive-thru, in couture and all. The next day you’ll call up a few of the chosen people from the night before to have an in-depth gossip sesh at the cafe around the corner from your apartment. So, your ideal meal: 6-courses set menu at some swank bistro or family style at your local Chinese joint. Cocktails over and over and over again. Skip dessert for a shot of tequila on the dance floor. Late night eats are your middle name. Lastly, you know all the spots that will serve sinful burgers, pizza slices and even pancakes, after dark. So tell me, which hostess style are you? I’m with you Justine!!! Though nothing store bought for me! I find myself somewhere between Julia Child and Patsy Stone! Beef tenderloin, fresh Bernaise sauce and all the Bollinger one can drink! Omg I love this post!!! 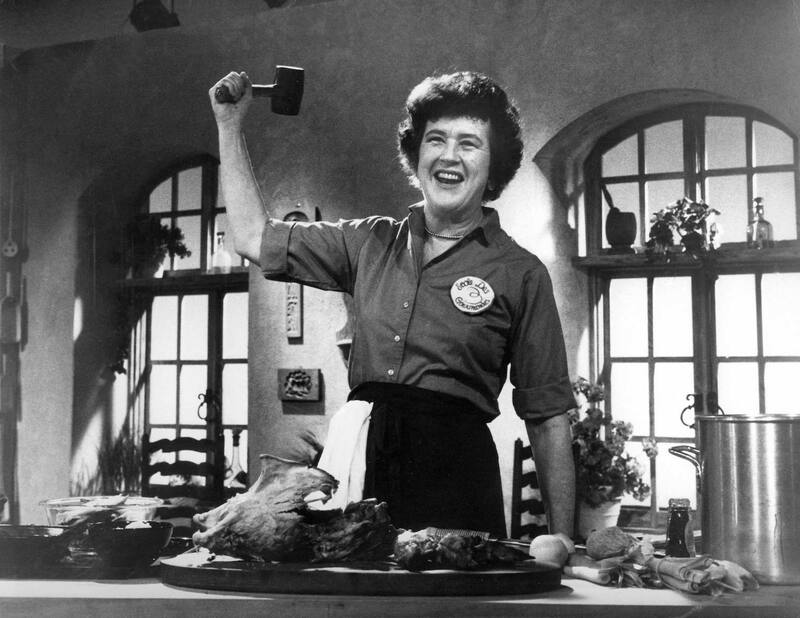 I’m Julia Child all the way! It’s an age thing! Omg you always give me such good references! Ok I hate/love her already!!!!! Going to spend the rest of my afternoon on her site. thanks. xoxoxo Happy New Year!!!!! Happy New Year to you too! I was just reading your recent post and was like “wait, wait, wait, I think I was that reader!” The whole Chrissy T. love/hate parallel is too true.